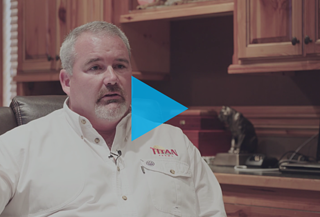 Titan was formed in 1999 by owners Chalmers Carr, Titan’s Pr esident & CEO, and his wife Lori Anne, when they leased, and eventually bought out, a longstanding family-owned South Carolina peach operation they had been managing since 1995. 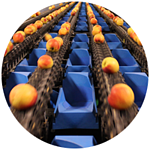 From the outset, Titan’s focus has been on consistently producing the highest-quality fresh produce for its customers, establishing the Titan brand as a recognized benchmark for quality in the peach industry. Titan’s ability to maintain and grow its reputation for quality and consistency has been underpinned by its owners’ ongoing investment in state-of-the art agricultural systems and practices, ensuring Titan remains at the forefront of its industry. Continued globalization and competitiveness of the fresh produce industry has led to customers placing a growing premium on and requirement for consistency, quality, traceability and safety of produce. 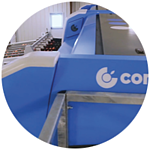 In 2013 Titan decided it was time to invest in a new sorting line to meet customers’ continually evolving needs. Following an exhaustive competitive review process with multiple vendors, Titan Farms selected Compac as its partner to upgrade its packhouse, based on Compac’s stonefruit solution and its Spectrim inspection platform. Titan’s new system was designed by Compac’s solution architects, working closely with the Titan Farms team, to create a tailored solution that specifically addressed Titan’s long-term needs and goals, as well as its near-term pain points. components and providing a ‘control layer’ across the whole system. Since its founding, Titan Farms has had quality as its number one goal. Consistency is critical to establishing and protecting a reputation for quality. Peaches present a challenge with handling and blemish grading; additional complexities arise from the fruit bruising easily and skin damage during the sorting process, with the potential for significant immediate wastage or future downgrading of quality, and an impact on consistency of quality. A key component of Compac’s stonefruit solution for Titan Farms, and a factor in its selection as partner, was its Spectrim inspection platform. Incorporating high-res cameras, infra-red imaging, specialized lighting and machine learning to set defined quality standards, Spectrim can identify defects consistently, quickly and at volume. Additionally, the platform is programmable and can be set for different varieties of stonefruit, an important capability for Titan, which handles up to 55-60 different varieties during a season. Gentle Handling: Peaches demand gentle handling. The line was designed without any drops for the produce; it is either transferred by being let down or passed down a gentle slope. In customer site tours, buyers of Titan’s fruit have been impressed at the state-of-the-art facilities and left with complete confidence about consistency and high grade quality after observing how carefully the produce has been handled and packed. 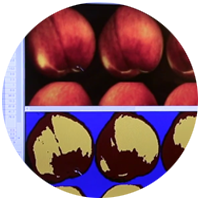 Defect and Variation Identification: Compac’s solution allows different standards to be set for ‘what good looks like’ depending on the variety of stonefruit. Spectrim employs its proprietary machine learning software, SmartSkin; with a simple click and drag interface, the operator can teach the system which parts of a surface are good and bad skin areas for each variety. Titan found SmartSkin very useful for identifying scars and thrip. Spectrim’s SmartMap feature is used to ‘teach’ the platform what defects it should capture and to then allocate a grade to fruit accordingly. The platform uses multiple wavelengths to capture typical hard-to-see defects, including soft spots. Spectrim is a gamechanger for detecting soft spots; using 2 Infrared wavelengths not visible to the naked eye, it can accurately and consistently identify ‘invisible’ defects below the fruit’s surface. With an average of more than 30% of fruit being off grade, the ability to so precisely categorize fruit allows maximization of potential revenue for each crop. Labor Costs: In addition to delivering enhanced brand consistency and quality for Titan Farms, another important factor was the reduction in packhouse labor costs. Traditionally, sorting labor has been one of Titan’s highest, and growing, production expenses, due to limited availability of experienced staff. In its first season of operation, packhouse sorting and grading personnel have been reduced from 48 to 12. With additional training, coupled with ongoing R&D driven system enhancements, within a year Titan should be able to manage with 4-8 people. The improvements in production speeds, and lower total labor costs, have already led to a substantial reduction in labor cost per pack. Food safety: Titan Farms has focused on food safety from the outset, incorporating it into its culture and approach; it was one of the first in the peach industry on the east coast to become Global Food Safety Certified. As such, food safety was another important consideration in selecting a partner for its new facilities. Compac’s global experience in best practice for materials, design and procedures for food safety informed the whole installation process, from closing the building in, installing air ventilation systems and different zones for the product, to machinery construction design, and using stainless steel and using FDA approved materials equipment for all fruit contact surfaces, making them easy to clean. Data: Titan Farms’ continued investment in technology isn’t just about labor saving. The data produced by the packhouse can now be used throughout the operation to make adjustments and improvements in real-time while also informing strategic decisions for the longer term. As part of the installation, Titan implemented Compac’s data solution for quality control which allowed them to transfer data from their Quality Control center and immediately feed information back to the line operator who could then make changes to the way he was grading fruit. The data collected also supports traceability of produce. Each piece of produce is tracked from the moment it’s picked all the way to the end consumer. In addition to providing the ability to precisely identify produce, should a recall ever be needed, the data can be used in conjunction with grading data from Compac’s inspection systems to make adjustments to growing environment. Operating Software: Because Compac’s Sizer software combines data from the Inspection System with Compac’s Nexus weighing system, Titan is now able to achieve consistently precise diameter sizing and improved weighing accuracy. In the first season alone, more accurate pack weights improved pack-out yield by 7%. Prior to the Compac install, Titan’s 5-year average pack-out was 70%, with 72% (with no quality issues) being the record for a year. In its first season with Compac Titan achieved 76%. “Sizer (software) is where the real innovation comes in; when we run 2 million boxes, that’s 100,000 extra boxes we’re going to get. When we multiply that extra by the market price that’s around $1.2 million dollars of increased returns to the farm.” Chalmers Carr, Titan Farms, President and CEO. Titan also uses Compac’s software modules, Automatic Throughput Control and Next Available Outlet. 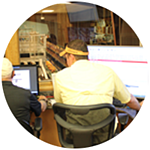 Throughput control automatically manages all conveyors, from infeed to packing, to optimize the produce flow and maximize throughput. Next Available Outlet allows Titan to minimize the number of volume fill outlets required, eliminating the need for a dedicated filler to each size. Titan Farms’ partnership with Compac and its investment in technology allows it to satisfy its customers’ needs, both those of the retailer, and the end consumer, who rely on Titan Farm’s brand promise of the same high quality, in every pallet and every bite. Retailers know they are receiving safe and high-quality produce in packs that always meet their specifications, with consistent weight, size and color accuracy. Since the investment in the new line, Titan Farms has invested in its own sales and marketing team, further supporting its continued growth as a company. The consistent quality, and multiple precise categories of fruit seconds, afforded by Compac’s data-rich solution, provides the sales and marketing team with the opportunity and ability to maximize the return on all of Titan Farm’s produce. 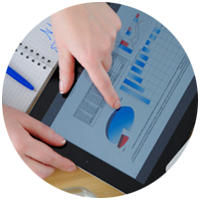 Compac’s integrated solution is designed to be able to adapt to incorporate R&D-led enhancements as they become available. Titan Farms, in partnership with the Compac team, is well placed to meet retailers’ and consumers’ demands for consistency, quality and safety of fresh produce, now and in the future.